This instructional book picks up where the first book left off, with over 50 more tunes, arranged for players of every level. If you enjoyed the "Milking Song," "Gyn Ennym," "The Goodnight Song," or the "Water Kelpie" in the first book, you'll absolutely love these new arrangements. This is my biggest and bestest book to date -- it's a hefty 118 pages! ~~CD INCLUDED of EVERY song in the book, played by Yours Truly on my favorite dulcimers. 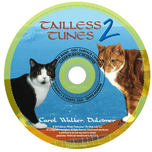 This CD will be a valuable tool to help you learn the songs, PLUS it was professionally mixed and mastered, and is an enjoyable CD just for listening.